Looking for a different idea for date night that isn’t the tried and true dinner-and-a-movie? 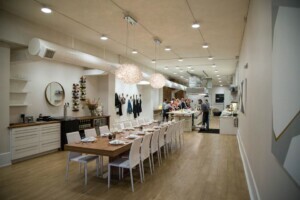 Check out Pearl Street’s Food Lab. Food Lab seeks to enhance the cooking and dining experience by teaching culinary skills and knowledge to home chefs of all skill sets through its cooking classes. It offers a variety of events, including its ‘Date Night’ series that transports guests to classic romantic venues through authentic cuisine. It also offers dish-specific cooking classes throughout the year. Each class is around 3 hours with the last half hour dedicated to tasting generous servings of each dish. Master a new skill, taste delicious wines, and enjoy an interactive date at Food Lab. We share upcoming date nights and classes below. Risotto is a seemingly simple yet surprisingly complex dish synonymous with Italian cuisine. Join Food Lab for this tasty class and get some professional pointers on cooking this classic Italian meal. Learn how to make authentic Israeli foods! Food Lab has carefully selected recipes from award winning chef Alon Shaya’s arsenal to share with you. Dishes include Labneh Dip with Red Pepper, Yemenite Stewed Chicken, and more. Paris is the city of love and romance. This date night teaches guests how to make traditional French recipes – like Moules Frites and Salad Lyonnaise. Wine and dine your date while sampling a few delicious plates from The City of Lights. Celebrate the occasion with Food Lab’s delectable menu. Dishes cover all flavor spectrums; from Lobster Risotto to a Citrus Tart, this is a great Valentine’s date idea that will entertain and educate. Escape the cold – if only for the night – with filling, zesty Argentinian recipes. Learn how to make empanadas and a traditional Chimichurri sauce. Ramen is the perfect Japanese comfort food, but it can be tricky to make. Let Food Lab introduce you to authentic Ramen – like Pork Belly Chashu and Tonkotsu Broth – and it might quickly become your go-to recipe this winter. Elevate your taco game with this fun cooking class. Food Lab will whisk you away to the sandy, warm beaches of Mexico with its take on tacos. Tacos Al Pastor, Three Chili Chicken Tacos, and Achiote Lime Shrimp Tacos are on the menu, so be sure to bring your appetite. Food Lab is constantly updating its schedule of classes and date nights, so continue to check back here for new events.